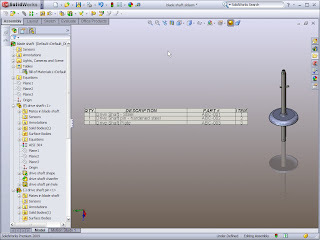 Parts and Assemblies have seen SEVERAL enhancements in Solidworks 2009. One of the most notable Enhancement is the ability to create Bills of Materials (BOM) in an Assembly file as well as Multibody Part Document also.It works with Weldment parts also. All the capabilities that we have in Drawing BOMs are also there in Assembly BOMs. When We create a drawing We have the choice to use the existing BOM created in Assembly or Part document in the Drawing. We can have the ability to restructure the assembly components in the BOM Table without affecting the assembly structure.We can dissolve the sub assemblies and weldments with the use of Part/Assembly BOM. We have the ability to edit the Part/Assembly BOM in seperate window .BOM Table which we created in part/Assembly will appear in Tables Folder in Feature Manager Tree.The name of configuration to which a BOM applies appears beside the BOM feature.